There is a lot of discussion about today - 'pram pii makara' (January 07). Regardless of point of view, most people do not mind a day off from work. Vietnam's invasion of Cambodia and subsequent fighting with China have been termed 'The Third Indochina War'. Some ardent politics-watchers were quick enough to respond with cartoons at the time - notably Garry Trudeau in several 'Doonesbury'strips. 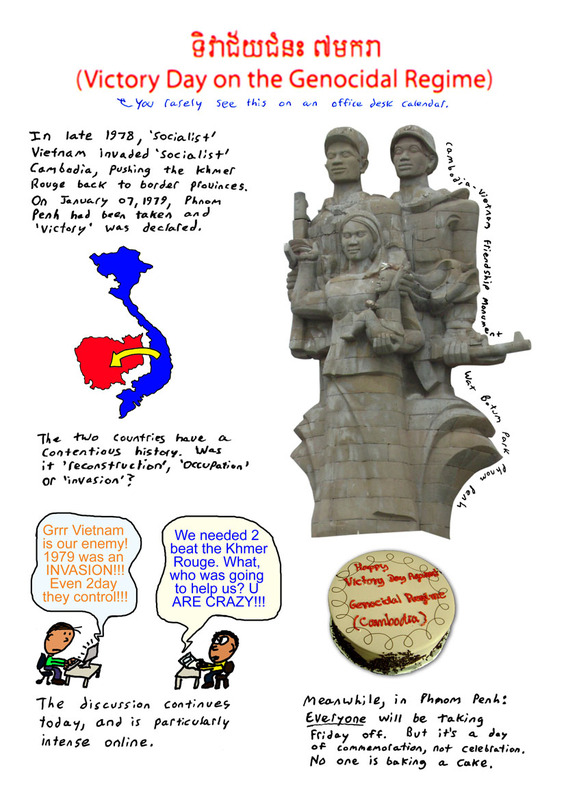 The memorial in the comic above seems to be Phnom Penh's last remaining piece of 'Socialist Realism' art on public display, and it's proven to be quite sturdy. Protesters doused it in gasoline in 1998 and it came away with hardly a scratch. I am hoping that this New Year people will temper their frustration and anger, engage in constructive discussion, and use facts and wit to demonstrate their point of view.